As the hot summer months quickly approach, it's time to start thinking about staying cool without spending all your money paying for the air conditioner to run. With a little maintenance to your air conditioner, and following a few tips to maximize the AC's efficiency, you will save money this summer while you beat the heat at the same time. Proper air circulation is the key to air conditioner efficiency. When the air circulates throughout your house using fans, the air will have a more even temperature. You won't have hot or cold air pockets in your home if you use fans, which allows your air conditioner to work less to keep rooms cool. You can use simple box fans on the floor, just be careful if you have little children running around your house. Ceiling fans are an excellent way to keep the air flowing through your home without any risk to running kids. Keep cool by protecting your windows from the heat of the sun. Using a protective solar screen or film, you can reflect a good percentage of the sun's heat away from your home. Reflected heat isn't going to enter your home, and you will remain cooler on the inside. If you have a whole house air conditioning system, it must be serviced each year by a professional. The unit needs to be cleaned, the filters changed, and any fluids topped off. 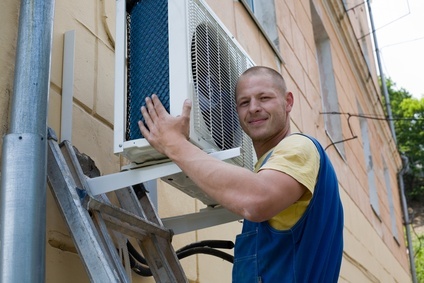 With proper maintenance, your air conditioner will run better. Simply turning on your system each spring and hoping it works well is a recipe for disaster. Before your air conditioner breaks down in the middle of a heat wave, call in a service professional to get your AC ready for the hot summer months. Don't turn on your oven or stovetop in the heat of the day. Open windows at night when the air is cooler to give your ac a break. Hang out in cooler areas, like the basement if it is finished. Plant shrubs or greenery near windows that face direct sunlight to help block the heat from entering your home. As you prepare for the summer, don't forget to get your air conditioning system serviced.